The choice to hire a plumber is often made in an emergency, once you have an urgent need for them. We offer you the following to help you make a decision. How long have they been in business? Plumbing companies who have been around a while have continued to do business usually because they have satisfied customers. Do they have a warranty. Make sure they are a plumber that stands behind their work! Are they going to be on time? Having to wait for plumbers, contractors or any repair person is not the best use of your time. Are there testimonials from other people? Do you know people who have used their particular plumbing service or can you find out about their work from other people. Look into their record at the Better Business Bureau and the Virginia Contractor’s Board. Try to find out if they have any complaints about them. 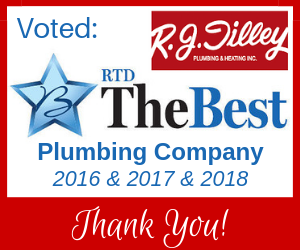 If they are a plumber who is licensed, been in business for many years, have a warranty on their work, are punctual and have a long list of satisfied clients who will tell you so, then they must be at R.J. Tilley. If you need a plumber, call the best plumber in Richmond, R. J. Tilley.